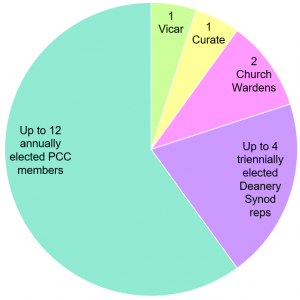 Representing the people of All Saints’ through its elected members, The Parochial Church Council (PCC) has a critical role to play. It is the decision-making body of the church. It has oversight over every area of the church’s mission and ministry, including the church’s finances, and carries the responsibility for setting policy, budget, and monitoring income and expenditure. The PCC meets monthly (usually on the third Monday of every month). Minutes of each meeting are posted in the Centre on the notice-boards and are also available here. Those names marked * are Standing Committee (SC) members. The SC has an executive function, prepares the PCC agenda and frames policy for PCC approval. It also has a critical role to play in implementing policy agreed by the PCC. The SC also meets monthly; usually the first Monday of each month.